Indexes fell by more than a percentage point today as oil prices slumped. 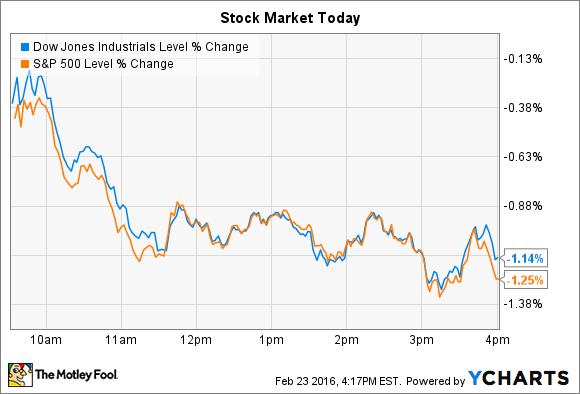 Stocks took a step back from their week-long rally today. The Dow Jones Industrial Average (DJINDICES:^DJI) dropped 189 points, or 1.1% and the S&P 500 (SNPINDEX:^GSPC) shed 24 points, or 1.1%. The see-saw in oil prices affected the market, as oil dove 4% after yesterday's 6% spike. As a result, energy was the worst-performing sector in the S&P. Quarterly earnings reports powered individual stock-price swings for Home Depot (NYSE:HD) and Fitbit (NYSE:FIT), which both posted holiday-quarter results before the opening bell. Quarterly comps gains for U.S. stores. Data source: Home Depot financial filings. Comps for the full year improved by 5.6%, which beat both management's recent target of 4.9% and the prior year's 5.3% comps gain. That translated into a 10% increase in profits, to $1.17 per share. "Our focus on improving the interconnected customer experience, along with solid execution and continued recovery in the U.S. housing market, resulted in record sales and net earnings for 2015," CEO Craig Menear said in a press release. Home Depot laid out an aggressive growth outlook for 2016, saying comps should rise by as much as 4.5% as the housing market continues to recover. Menear and his executive team believe they'll hit their profitibilty goal of 35% return on invested capital by the end of 2018, which seems likely given that ROIC improved by 3 percentage points to reach 28% last year. In the meantime, shareholders will be paid well for their patience: Home Depot raised its quarterly dividend by 17% to $0.69 per share. Wearable tech specialist Fitbit's stock dove 21% lower today, bringing its year-to-date plunge to 56%. The company announced fourth-quarter earnings results that were well ahead of Wall Street expectations, but its outlook for the coming year disappointed analysts. The holiday quarter was a good one for Fitbit. It sold 8.2 million health and fitness devices, compared to 4.8 million in Q3. That success at retailers helped push revenue up by nearly 100% to $711 million -- far above the $650 million that marked the high end of Fitbit's guidance provided in early November. The Blaze smartwatch. Image source: Fitbit. The company didn't have to resort to price cuts to move all that merchandise, either. Gross margin ticked up to 49% of sales from 46% a year ago, meeting expectations. "We are beginning 2016 with strong customer engagement and retention, an accelerating pace of innovation and competitive differentiation, and a foundation of significant revenue growth and profitability," CEO James Park said. Yet Wall Street was spooked by a conservative outlook from management that targets sales of $440 million and roughly zero non-GAAP earnings per share. Consensus estimates were instead looking for closer to $484 million of revenue and $0.23 per share of profit in Q1. Fitbit explained that the results will be pinched by extra manufacturing and marketing costs in support of its first-ever global product launches (the Blaze and Alta devices). Looking further out, the company plans to make major investments this year on building out its global infrastructure and developing a deep pipeline of new health- and fitness-tracking devices.